The whole process, starting and going over the process of buying a home and their attentiveness to walk us through the process. Heidi and Jerri in the sales office are an asset to the Raymus company. 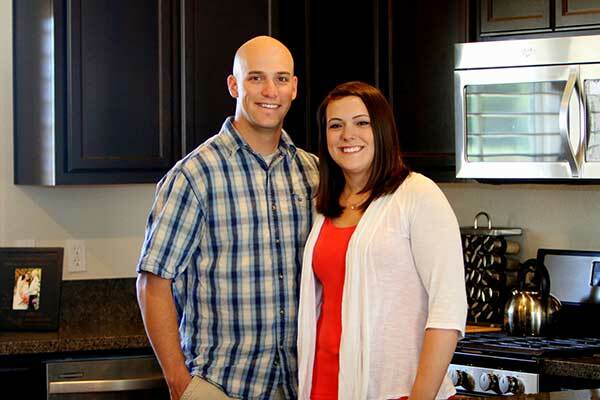 They were available to answer all of our questions and concerns at every level of our home build. We love our home and our new neighbors. It is a family atmosphere that we will enjoy for years to come. 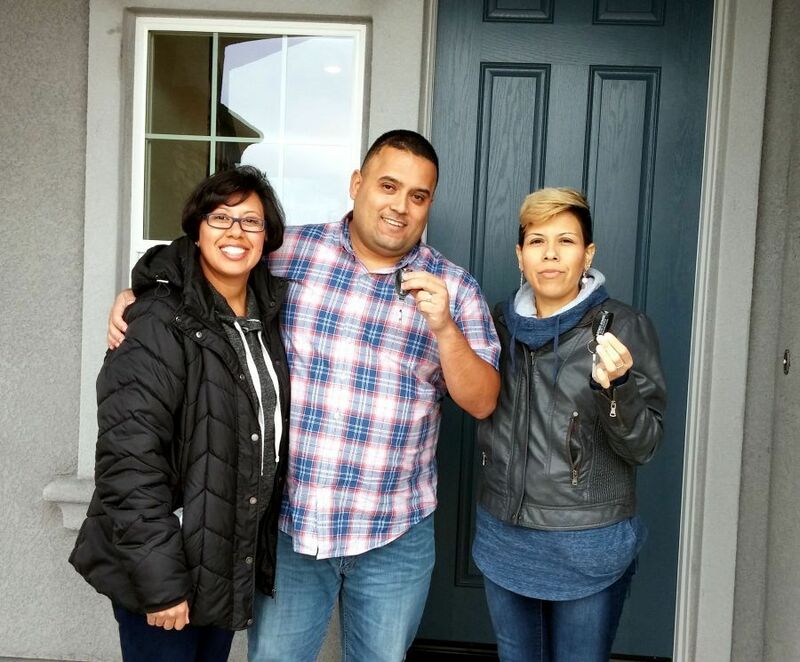 Heidi and Jerri in the sales office are amazing they helped me tremendously throughout my home buying process. Thank you, I love my home! Heidi and Jerri at the sales office are two of the most polite and friendliest! Every time my wife and I came into the office, they made it very easy for me to decide to purchase our new home, they had an answer for whatever questions we had. Very professional. Thank you to the both of them. 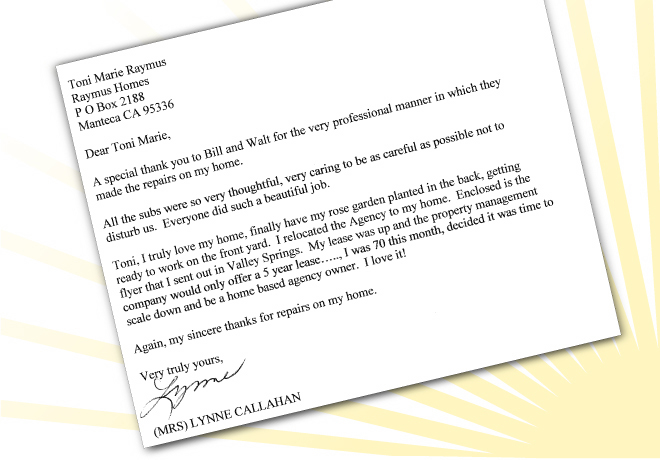 I received exceptional service from all Raymus Homes staff. Very customer driven. Not like most home builders that simply build the home and walk away...Very happy with both home quality and home location. Finally a home that has the things I want! 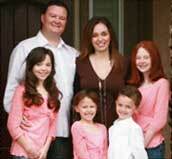 I was most satisfied in that Raymus Homes seems to be very flexible with us. 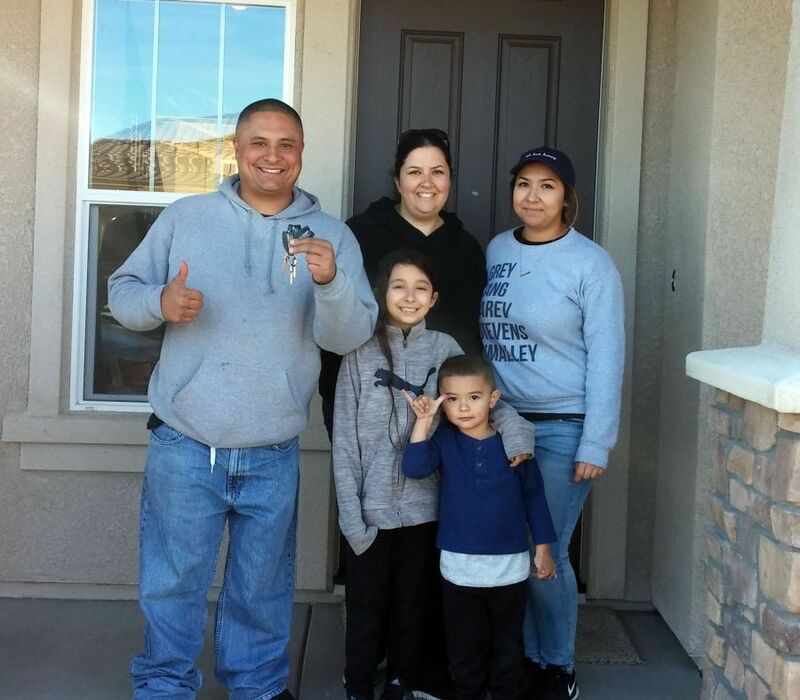 We originally had four people buying the house together, then we changed it to just two people, and Raymus Homes still made it work for us. We were a special case, and they handled us well. We are extremely happy with our home and the service. Not only did we get a beautiful, wonderful, and well built home. We also received customer service that was top notch. We felt like part of the family. 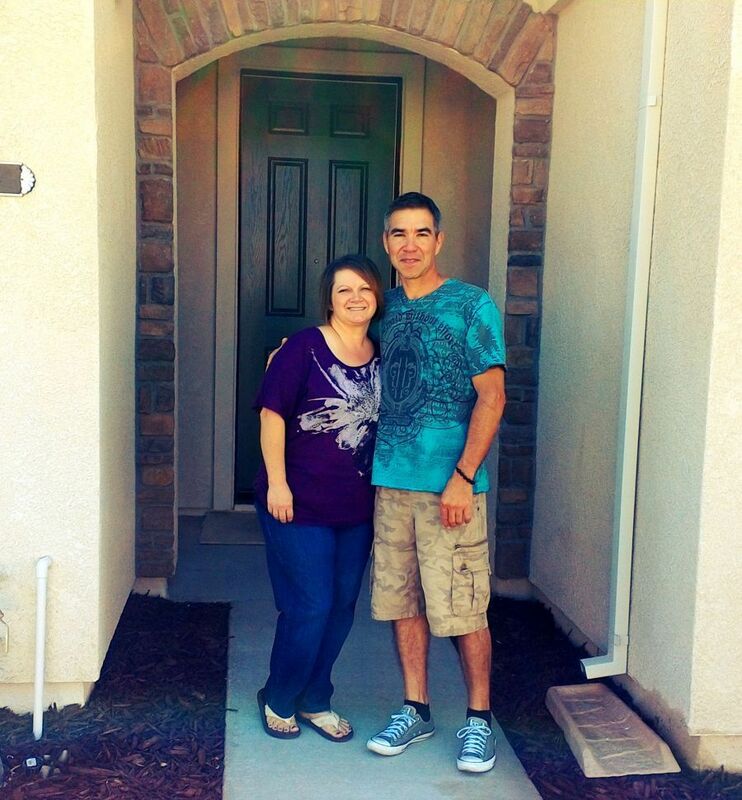 Thanks again Raymus Homes, we love our new home. I highly recommend Raymus Homes, as they are a local builder providing a quality home with great value. 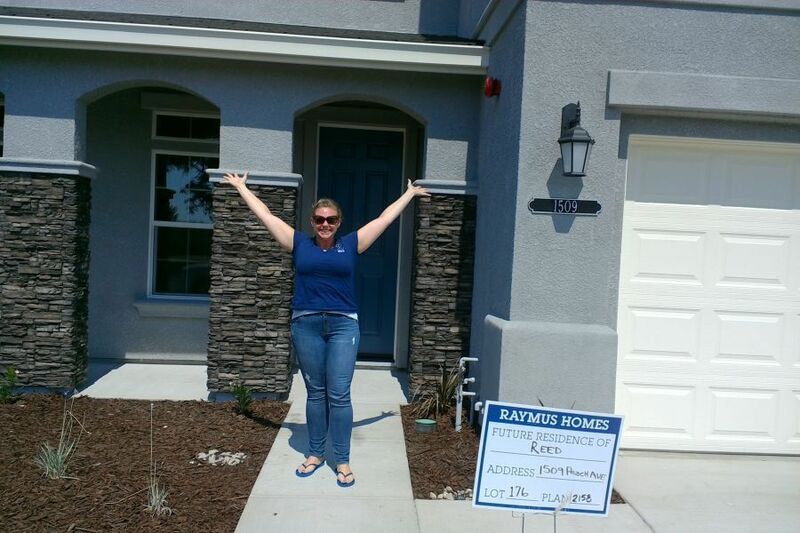 I had a very good experience working with the Raymus Homes' staff. Thank you so much for taking your time today in helping us make some of the decisions regarding our new home. 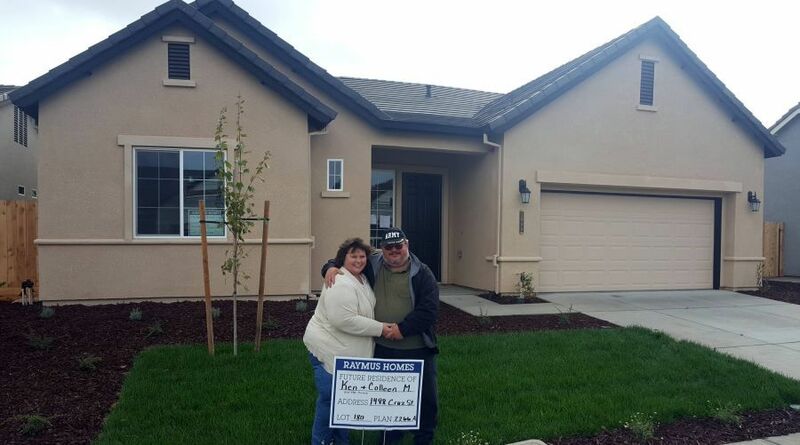 Raymus Homes has been a pleasure to work with and we are so excited for the end result. The variety of options that you have offered us is absolutely wonderful and for that we want to thank you! I want to thank you for the beautiful house you built for us. Henry was a pleasure to work with! I want to thank everyone that made this possible. 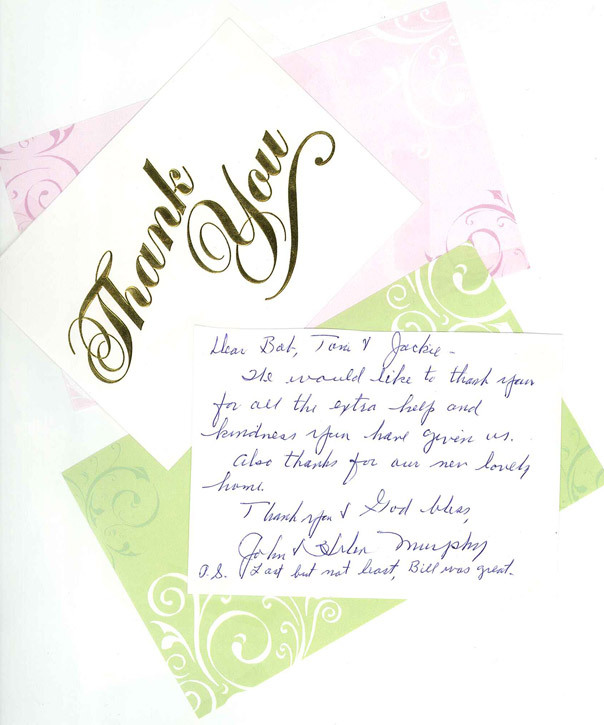 A special thank you to Bill and Walt for the very professional manner in which they made the repairs on my home. All the subs were so very thoughtful, very caring to be as careful as possible not to disturb us. Everyone did a beautiful job. Toni, I truly love my home, finally have my rose garden planted in the back, getting ready to work on the front yard. I relocated the Agency to my home. Enclosed is the flyer I sent out in Valley Springs. My lease was up and the property management company would only offer a 5 year lease... 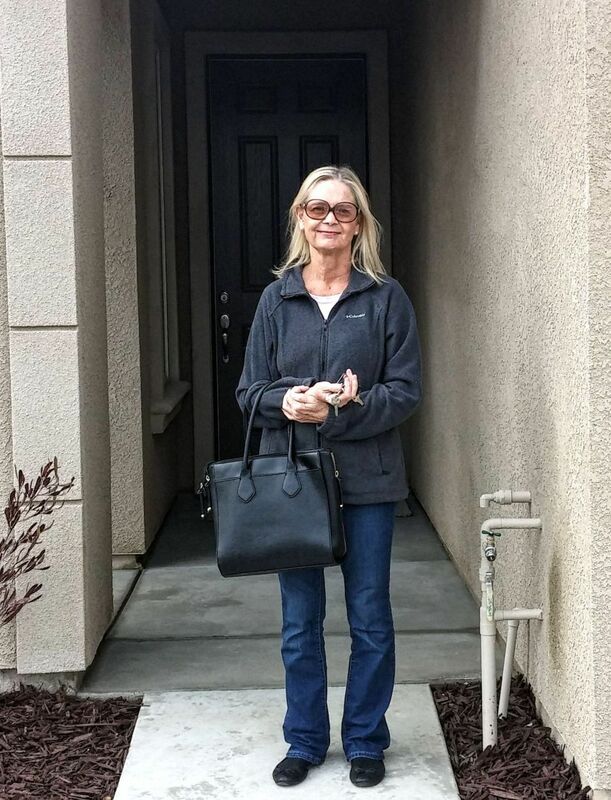 I was 70 this month, decided it was time to scale down and be a home-based agency owner. I love it! Again, my sincere thanks for repairs on my Home. Thank you both for making our dream a reality and for holding our hand every step of the way. We could have never done it without you. We have been meaning to write and tell you how much we love our new home. It was not truly until yesterday when I showed a friend in great detail the house. How lucky we were to build a Raymus Home. I told my friends over a dozen times about all of the special requests we made and how my needs were met whenever the specs warranted. I found myself repeating yesterday how each of the subcontractors were so proficient and patient, from the design team to the electrician until completion. It cannot go without mentioning what a diligent job Ryan does for Raymus. 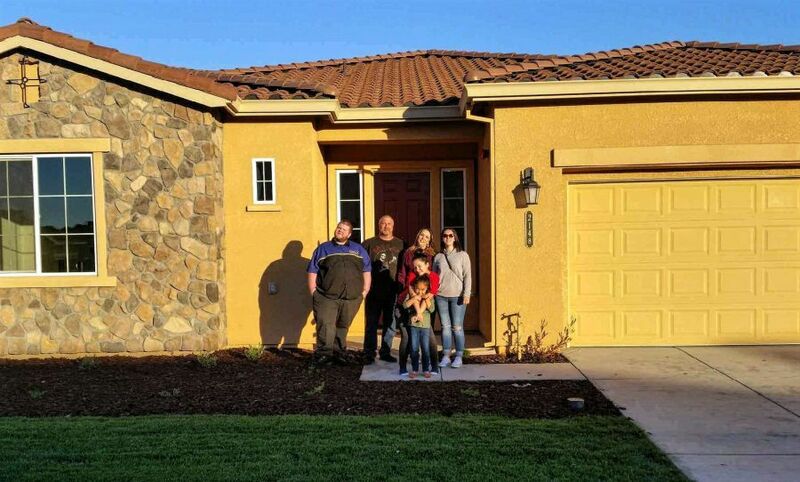 This was our first semi-custom home-building experience and we put Ryan to work with a billion questions and visits to our new home under construction. Sometimes, he would let us in 3 or 4 times in a single day! He is always patient, professional and has a great sense of humor during what can be a stressful period. He is a great addition to a company who shows extreme pride in their employees. Our experience with building a home with Raymus was painless to say the least. They are welcome and open to suggestions, which is a reflection of the attitude of the ownership- always willing to help the customer. 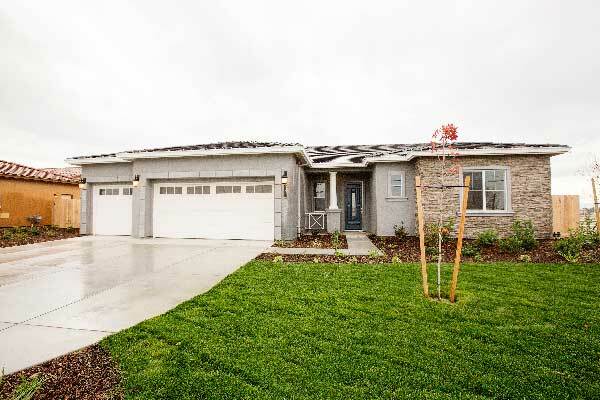 Our new home was ready for move-in, as promised, on the estimated closing date. Thanks again to each everyone for your time and effort. The labor has bared the fruit. Just wanted to say thank you for all you have done for us. We really appreciate your patience with our 1001 questions. Many of which probably should never have been asked, but you were very kind and considerate and never made us feel foolish for asking them. You are a real plus to the Raymus team. We are very pleased with our newly acquired lot and love the new sign on the property (Future Home of Mr. & Mrs. Smith). Of course, we had to have our picture taken beside the sign. We usually go by once or twice a week just to look at the lot. We believe we have found someone to draw up our plans and hope to start that process this summer. Our target date is still around the first of the year if all works out. Express our thanks to the Raymus group, as everyone did a class act job on this sale and we appreciate it very much. When our children were born, my husband and I began searching for a community to have our family call "home". 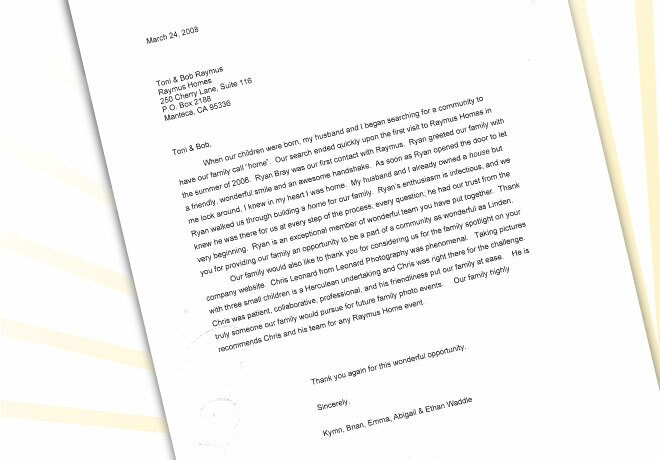 Our search ended quickly upon the first visit to Raymus Homes in the summer of 2006. Ryan Bray was our first contact with Raymus. Ryan greeted our family with a friendly, wonderful smile and an awesome handshake. As soon as Ryan opened the door let me look around, I knew in my heart I was home. 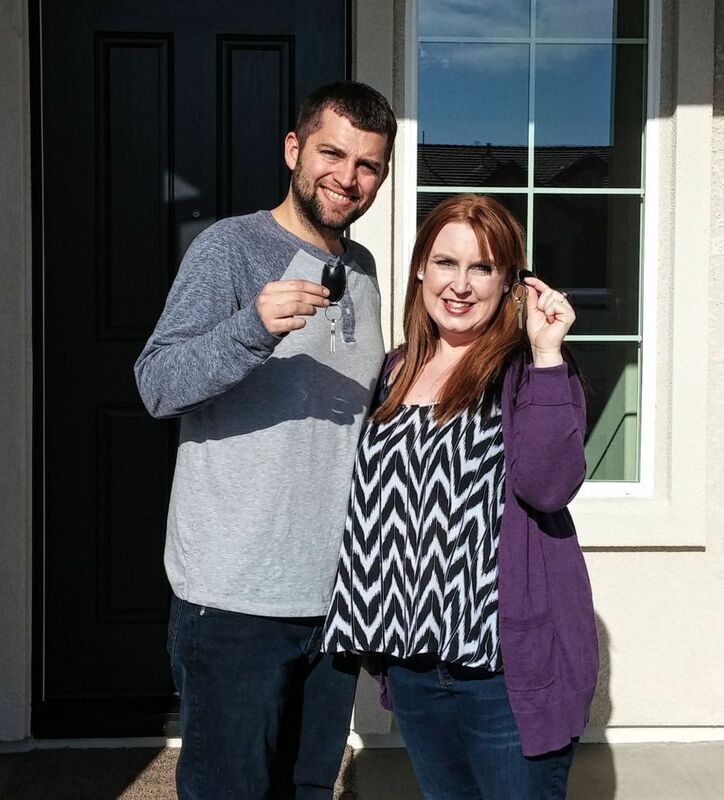 My husband and I already owned a house, but Ryan walked through a building of a home for our family. Ryan's enthusiasm is infectious, and we knew he was there for us at every step of the process, every question, he had our trust from the very beginning. Ryan is an exceptional member of a wonderful team you have put together. Thank you for providing our family an opportunity to be a part of a community as wonderful as Linden. 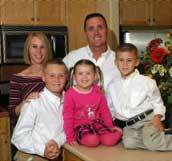 Our family would also like to thank you for considering us for the family spotlight on your company website. Chris Leonard for Leonard Photography was phenomenal. Taking pictures with three small children is a Herculean undertaking and Chris was right there for the challenge. Chris was patient, collaborative, professional, and his friendliness put our family at ease. He is truly someone our family would pursue for future family photo events. Our family highly recommends Chris and his team for any Raymus Home event. We would like to thank you for all the extra help and kindness you have given us. Also, thanks for our new lovely home. We’d really like to thank Raymus Homes for all they did to help us build our new home. All of our upgrades were completely worth it – especially the outlets and plugs for speakers in the great room. It was a relief to have everything in place so when we were ready to buy and install speakers, all the hard work was done and it was super easy! 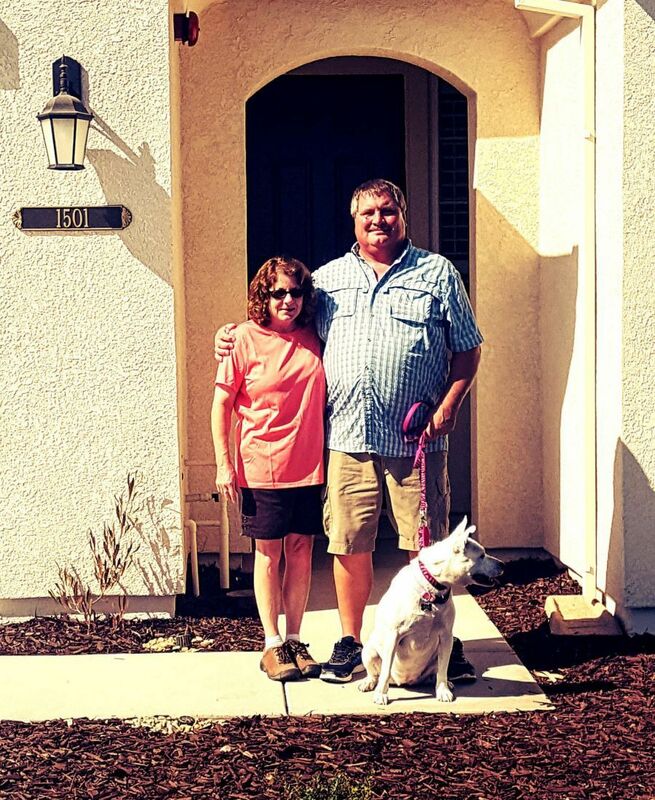 We are just so pleased with all the great service, advice, and friendship we received from the Raymus Homes team.